I put this on hold because the inductor used has a number of connections and although only 2 of them are being used it may make it difficult to mount on vero. So I will put it on hold and maybe look at doing a daughterboard for the inductor, or maybe even using a different type like a Fasel which will be easier to mount on the vero board. 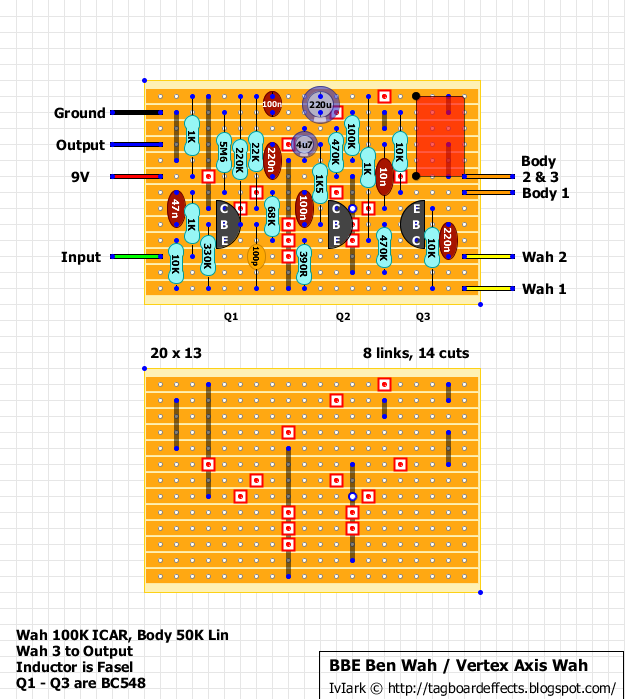 If anyone has any inductors they want to try then post info about them and I'll look at the best way to adapt what you have to this layout with possible just a couple of extra links required. Update 2: I have changed the layout to incorporate a Fasel inductor for the time being, but will add mods for other inductors as required. Thanks very much to CodeMonk for all the hard work he put into the degoop and trace. I think most of you will know this story already. 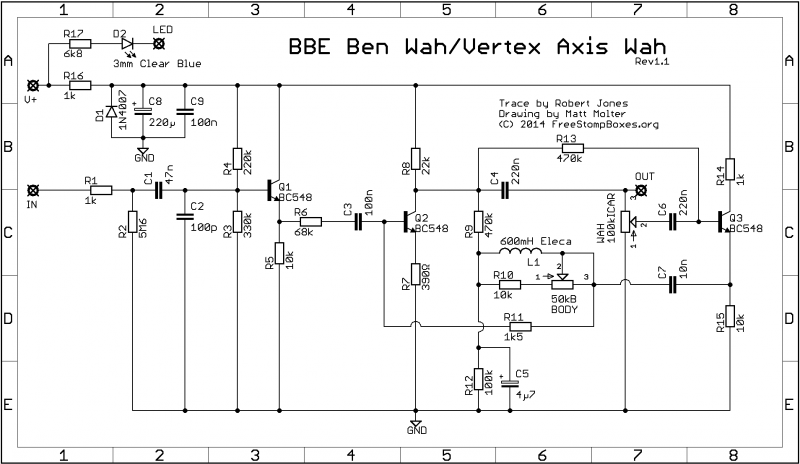 Basically Vertex have been selling their Axis Wah for $349.99 and it turns out that it's a verbatim $149 BBE Ben Wah which has been gooped and relabelled despite Vertex claiming they were hand made in the USA with custom wound inductors. They even sell a NOS version which is $50 more, and which has absolutely no NOS components in it, just the same BBE board with a different pot. So basically it's the modern day Freekish Blues story with the other similarity being that Vertex are another TGP favourite and some people on there with absolutely no self respect will still argue Mason from Vertex's case and not hear a bad word said against him. Amazing how fanboyism can turn some peoples' brains to mush to the point they refuse to acknowledge the damning evidence staring them in the face. I love guitar effects, and companies like Vertex and Freekish Blues give the industry a bad name, making it difficult to trust new manufacturers and products on the market for fear that you're being ripped off. Hopefully when Vertex endorsers like Landau realise what company they are associated with, Vertex will go the same way as Freekish Blue. Just beware for Mason's next company popping up in a guitar shop near you! In next weeks episode. 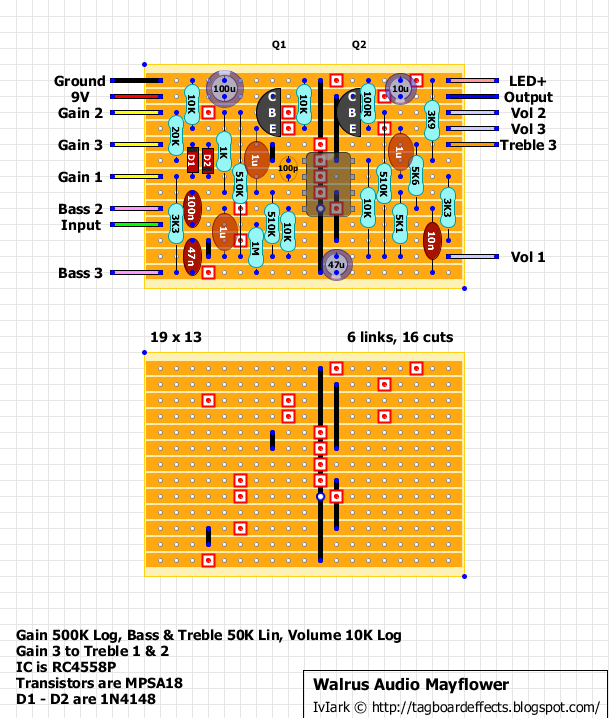 How Vertex's totally gutted and rebuilt (in USA allegedly) Boss volume pedal is in fact a Boss volume pedal with the tuner out components removed [shaking head facepalm smiley required]. ...the BBE Wah has the sweetest, most musical voice of the bunch. Its potential to be a first-pick wah for any kind of music earns it an Editors' Pick Award. - Guitar Player Magazine"
The Axis Wah is the finest representation of a 1960's style Wah with a few modern additions. It is designed to produce the most vocal characteristics reminiscent of the classic Wah tones we know and love, yet provide a smooth and rounded top-end that doesn't get too bright. Each unit includes our custom hand-wound HALO inductor, hand-made custom potentiometer, and hand-picked components to give this wah its distinctive voice. Request. This effect needs a 3V supply and is a positive ground effect so I've included a 3.3V regulator and an ICL7660S to provide the -3V (ish). You can omit that and power it with a pair of AA batteries or standalone 3V power supply if you prefer, but if you do remember to wire it as a positive ground effect. Consider socketing the 1K5 resistor to experiment with values to get the best sound out of it, or maybe replace it with a 10K trimmer. 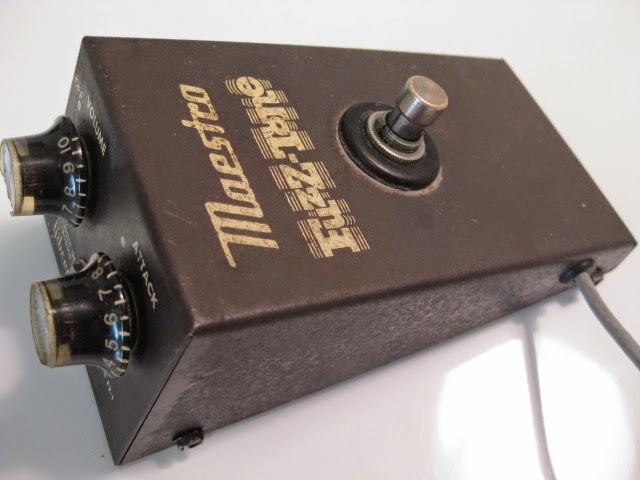 "The daddy of all stompboxes: the first commercially produced transistor-based guitar effect pedal and also the first fuzz box. First made in 1962, it took until 1965 to catch on when Keef used one on Satisfaction – and the world of guitar tone was changed forever. 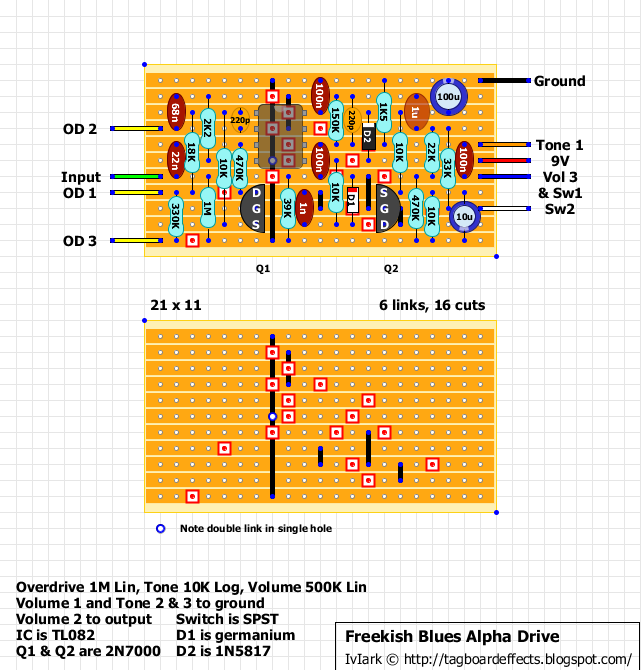 The FZ-1 used three germanium transistors to amplify and clip the guitar’s signal creating fuzz, glorious fuzz…"
Thanks to Pawel for his schematic posted on FSB. 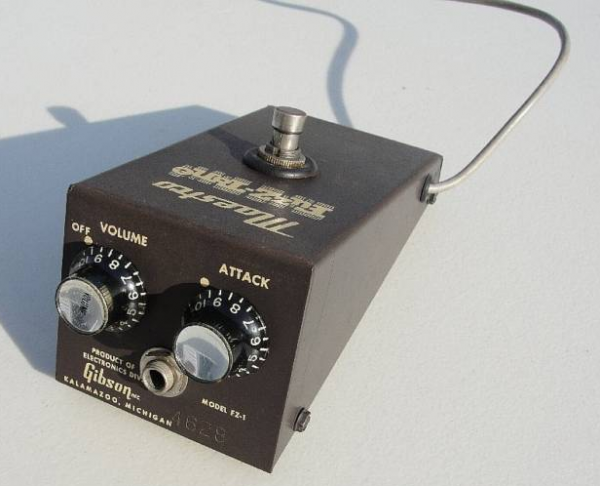 I can't find much info on this one or clips, but it is very close to being a Foxx Tone Machine so that should give you a good idea what to expect. Pawel traced two units with the second being slightly different, using BC109 transistors, the 100K Q3 base resistor is 150K, the 5n cap is 3n3, and all pots are 100K log, so build whichever one takes your fancy, or socket the positions to try both. As pretty much everyone must know by now this pedal was a re-badged Joyo Ultimate Overdrive with 3 resistors added, and that in turn is a very lightly modded OCD. But the TGP favourite Freekish Blues Alpha Drive does still have a lot of fans who will argue to their back teeth that the sound in more important than being deceived, bent over and shafted by a builder. So I thought I may as well include a layout so we can build one and see for ourselves whether it is indeed worth losing all self respect over. 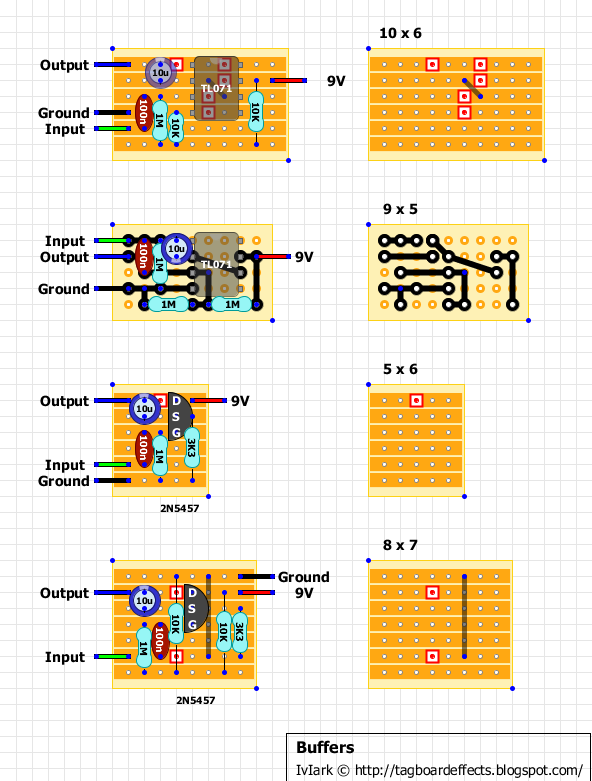 This could have been made simpler by using pot values which more closely matched the originals + parallel resistors but I didn't want to do that because this method will give you odd tapers which may be part of the "magic", and so I wanted this to be exactly as per the Alpha Drive. The Joyo UOD made a couple of small changes from the OCD, including a couple of value swaps and a slight variation in the mosfet clipping. I do expect this will sound and feel different than both the Joyo and the OCD, so certainly worth a build even if it's just for comparison purposes. But I would like to stress that the $35 Joyo is extremely close to the $160 Fulltone OCD for those in the market now Voodoo Lab has stopped making them. Working closely with the east coast singer-songwriter, guitarist and Berklee Guitar professor, Freekish Blues has developed an ultra-sensitive, clear, amp-like overdrive pedal that cuts through where others fall short. Thaddeus, an award winning guitarist has been using high end Dumble or "D-Style" amps such as the Two Rock Custom Reverb Sig 1, Ben Harper's 100 Watt Custom Reverb Sig 1, Bludo Bludodrive, and the Quinn SDO in his line-up for some time. He had been in search of the ultimate versatile pedal that could deliver those tones along with a wider range of tones from rock to blues, from classic to contemporary and fusion. Even a relatively clean boost is possible with this pedal! The Alpha Drive has a very smooth but articulate quality that one will find pleasing. This pedal has been played against some of the finest Dumble style amps and pedals on the market today. Pedals such as the Ethos Overdrive, Zendrive, Dumkudo & Zenkudo pedals. That being said the Alpha Drive at this price can't be beat. The controls - Volume, OD and Tone - actually make a difference, and the pedal cleans up with a lowering of the guitar volume. Featuring a true mechanical bypass foot switch and internal components normally found in the circuits of tube amplifiers, this pedal is built like a tank! The battery can be changed in seconds with the easily accessible secure battery cover. No screwdriver required. The Switch: The Rock up switch gives a little bit more of a midrange presence edge allowing you to cut through. The Blues down switch gives you that warm brown bluesound. This would be great for the folks who have single coil vs hum-buckers or just to get an extra bite, depending on the instrumentation in your band...I like both, depending on the song.. The switch acts very similar to a Dumble Mid Switch. This is a really great sounding fuzz and definitely something different from the norm, so props to Resonant Electronic Design. You'll notice on the layout there's a cap marked ??? and as you can probably guess the guy who did the trace didn't get the value of that one. Looking at it though I suspect is may be a 2u2 poly cap because it is next to a 1u poly cap on the board but is physically larger. I would definitely suggest socketing that one to test, but I think 2u2 is the value I'd try first. The polarised 1u and 10u caps in this are tantalum and the 470u at the bottom left is rated at 6.3V which should allow you to keep the dimensions down for that one. The 470u cap in the centre is the main supply filter cap and so will need to be rated sufficiently for the supply you intend to put in it, but if you're using 9V then a 10V cap should be fine as the series reverse polarity protection diode will be shaving around 0.7V off the voltage anyway. Thanks to skywise for the pics and trace and mmolteratx for the scheme. Most guitar players either love or hate fuzz pedals. We found ourselves on the fence. We love the classic tones of Fuzz Faces, Tonebenders, Big Muffs, and other early fuzz designs, but many of them are prone to splatty, overly-compressed sounds when set to anything but the optimal settings. Modern fuzzes can do some amazing tricks and can produce some unique tones, but often they are one-trick-ponies relegated to the bridge of a song, random use during late-night jams. 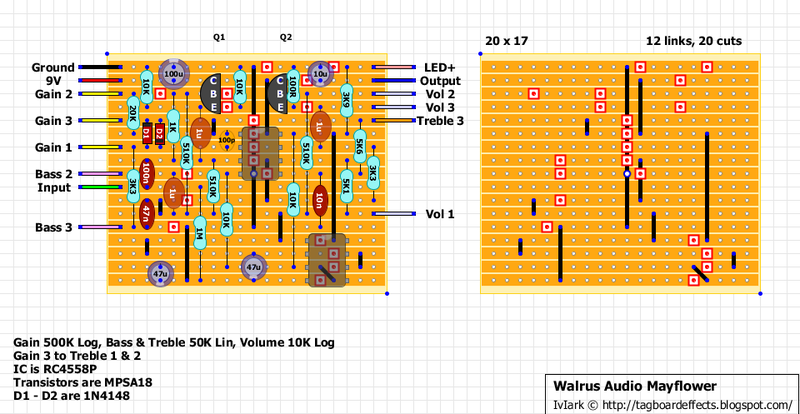 We wanted to design a fuzz pedal that could do it all and never sound out-of-control or unusable. The task was to create a circuit that could produce vintage fuzz style tones, explosion-esque modern-fuzz-style tones, and everything in between - all without ever getting overly noisy or misbehaving. 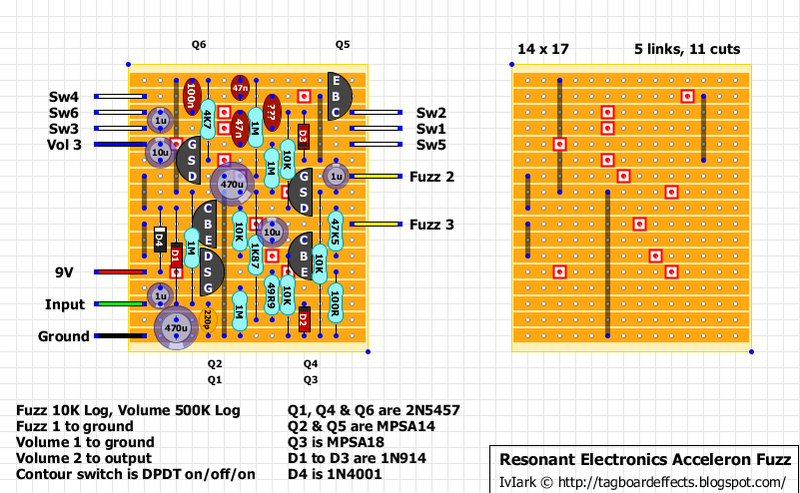 It took some serious tinkering and an entirely new approach to fuzz circuits, but we did it. This thing will roar, scream, and sing - all at the turn of a knob, and it will never let you down by being unpredictable or unusable. Just like all of our Field Effects pedals, the Acceleron Fuzz uses a discrete Class A topology and is built with audiophile grade components. This is the fuzz that will replace a pedal board full of other fuzz pedals. The Mayflower is a true bypass, midrange overdrive pedal that falls in-between the Voyager’s low gain preamp settings and the Iron Horse’s full and harmonically rich distortion. The Mayflower boasts a transparent, midrange signal that is great for cutting through or adding to the rhythm. It includes Level, Drive, Bass and Treble controls for a large range of tonal versatility. The Mayflower provides a transparent and organic sounding breakup that allows tweaking and shaping to boost your original tone. Only one channel of the second IC is being used, and that is only being used to buffer the reference voltage. There are a lot of pedals that work perfectly well without doing this, not least of which the pedal it's based on, and so as this is a low-ish gain Timmy with buffers I'm not too worried about excess noise. So to save space this layout removes the second IC completely and just uses a normal unbuffered voltage divider for vref. I don't expect any significant audible differences between the two so I think this is the one I'd build. 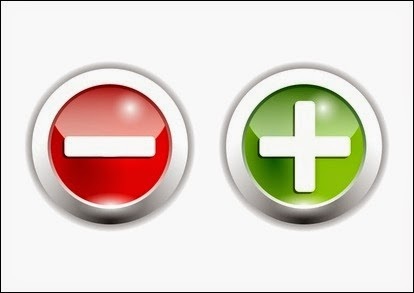 One thing that makes this topic confusing for some is that we can often think of the supply having a +9V positive side and a 0V negative, but although this is often perceived to be true, it isn't exactly the case. With a floating supply like from a battery or isolated power supply there is no point of reference until it is in a circuit and so the only thing we know for sure is that the positive side is 9V greater in potential than the negative. In a common negative ground effect this makes perfect sense to us, ground is 0V and the positive supply is +9V, but when we build an effect and are instructed to connect what we think of as the +9V side to ground it doesn't compute. 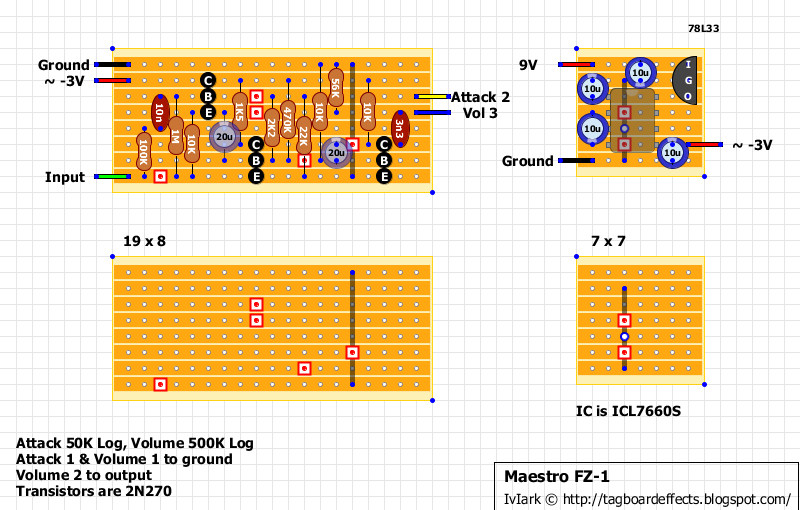 When you have a chain of effects, ground is fixed at 0V by the negative ground effects, and more importantly your amp which is connected to all effect grounds via the sleeves of the connecting cables. So that "9V connection" to ground you made in your positive ground build is set at 0V by the local connections. This gives a reference point for the supply, and remembering the negative side going to the supply point of the effect circuit is 9V lower, that determines it must be -9V. This is why it is never a problem to mix negative and positive ground effects in your chain. Ground is always 0V with each pedal having either a +9V or -9V supply when in circuit depending whether the ground connection has used the negative or positive side of the source of supply. The problem with mixing negative and positive ground effects comes when people try to power them with the same source of supply. In this instance the power supply isn't floating any more, negative is 0V and the positive is 9V and so making that non-computing connection from positive to ground creates an immediate short which will usually destroy your power supply unless you have one with a fuse or some other sort of short circuit protection. 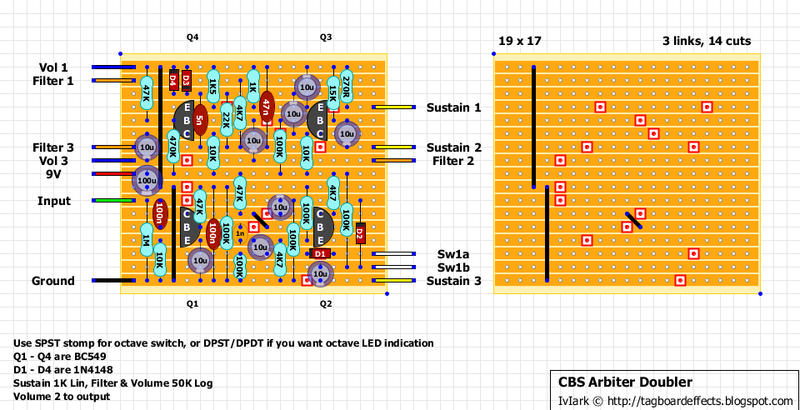 This is why power supplies with multiple isolated outputs can be very useful. Because the channels are isolated from each other, they find their point of reference independently and so you can have one powering negative ground effects at 0 to 9V and the other isolated side powering positive ground effects at -9 to 0V. 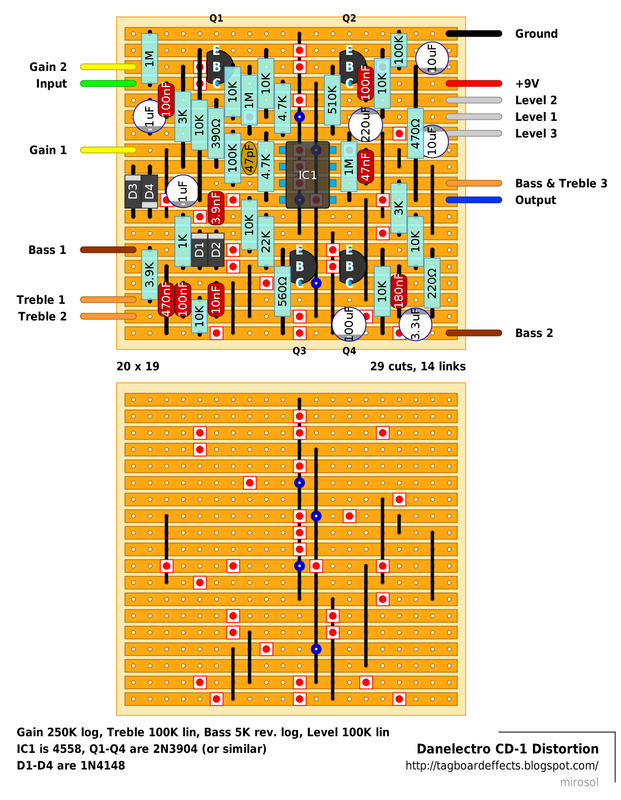 Then there is no problem in daisy chaining all your positive ground pedals together from one isolated output channel, and likewise daisy chaining all your negative ground pedals together from another. Always ensuring of course that the current available from each output isn't exceeded by the pedals' combined consumption. As an alternative, and something I always recommend trying with the layouts on this site is to use a charge pump IC to provide a negative voltage. The charge pump takes a 9V input and gives a -9V output, so instead of connecting the positive side of the supply to ground this allows you to keep all ground connections 0V, and supply the positive ground effect with the -9V from the charge pump. Common ground, common power supply. After checking a few things out, this turns out to be slightly modded Maxon DS-830 (thanks johnk for noticing). The 47p, 10n and 180n cap values are measured on board, so i'd suggest using sockets for those and see what values work the best for you. Anyway. This should be safe to build. Playing around with the original, this may be one of the most underestimated drive pedals around. You won't be saving any money building one for yourself, but this way you'll be able to tweak the gyrators and clipping diodes to suit your taste. Thanks to Miro for his great work with the trace for this one. This is more an adaptation than a verbatim clone, but will give you the same results. The original used a CD4066 quad bilateral switch to do the Tone Wicker switching which seems very much like an unnecessary inclusion when you consider all it is doing is bypassing the 470p base collector capacitors, so it seemed that instead of using a DPDT switch and CD4066 with the associated increase in required board space, it makes much more sense to simply use a 3PDT toggle for exactly the same results. Since we're posting tiny circuits today, i thought i'd post a recently traced booster. No input cap, no power filtering or any other modern day trinkets. Tiny booster with outside the box thinking in design. Thanks for trace to Bernardduur at FSB. Following a couple of threads in the forum where people had oscillation problems with certain effects that disappeared when a buffered pedal was placed before them, I said I'd do a post on here with a few different compact buffers that people could try tucked away in the box to place in series before the effect board. JFET buffer with voltage divider for increased headroom. 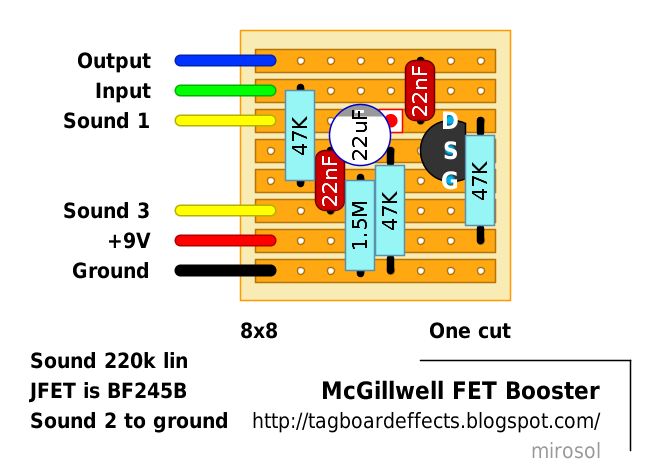 Looking at the differences in sizes I'd be tempted to try the basic JFET buffer first, because if that does the job well enough it's so small that it should be easy to fit in any effect's box with the minimum fuss. Had drawn this a long time ago and even build a few for my personal use. 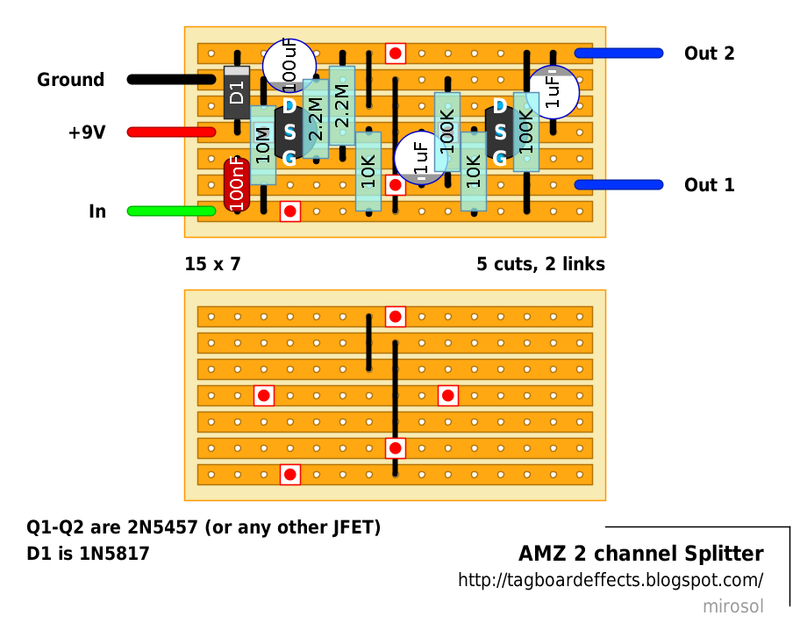 AMZ buffers are known to be very good in sound quality, so the splitter is that too. 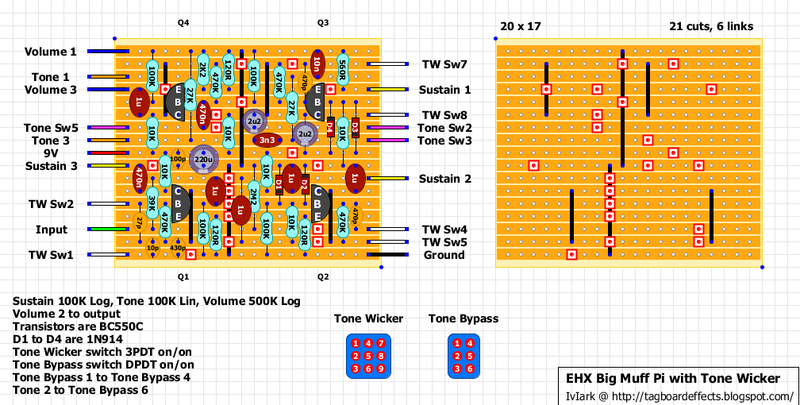 It is very modular and it can have as many output channels as needed. The most common use would still be to have simple splitter - one input and two independent outputs. I used this circuit the last time i was in studio to gain two separate signal paths to two different amplifiers. We already have mixers and other utility boards listed, so i think it's time to have this one too. It'll be nice fit to 1590A box.